I had never run an evening half marathon before, so preparing for the race weighed on my mind. I ran enough to know how to prepare for the morning, but I figured I needed to watch what I ate and take it somewhat easy during the day to get ready. A morning in the Magic Kingdom and relaxing in the afternoon until I could catch the first bus out to the fields prior to the corrals was the game plan. Once on the field, I was able to catch up with friends, take some pictures, and bask in the unseasonable warmth of November. High humidity and temperatures plagued us in the days leading up to the race, where I was sweating through my clothes standing still, but most of the runners were just hoping that there was not the monsoon like conditions of the previous year as they ran the course. Close to an hour before the start time, we were about to head to our corrals when we were ushered inside due to some errant lightning. A little rain poured over us as we headed towards the ESPN Wide World of Sports field house to wait out the possible storm. Race organizers watched the weather and debated what to do about the the half marathon while we spent time hoping to get out and run. After about an hour, we were informed the race would go on. At the time we were supposed to start running, we were returning to the holding area before the corrals. Again we stood out in the field as we awaited entrance to our corrals. Wondering among ourselves what would happen to the race as we passed rumors and theories and checked social media. Eventually it came down on Facebook the race would go on with a shortened course. We were no longer running through Animal Kingdom, but going from the start at Wide World of Sports to Hollywood Studios. Soon after, we were finally allowed to head out to the corrals, where the new course was confirmed by the race announcers. From corral B, I was able to watch all the prelaunch festivities as they led up to the start of the race. An hour after we were supposed to start, the gun finally went off and the first group of runners began their journey. Minutes later, the gun went off again and I was heading north on S Victory Way to join them. A left turn onto Osceola Parkway led us to the one mile marker and the course derivation. We were supposed to continue on Osceola Parkway to Animal Kingdom from there, but instead we turned right and headed north onto the on ramp for World Drive. Near the off ramp that would take us to Buena Vista Drive, the eight mile marker popped up and we were on our way to the final five miles after barely completing two. Soon after, we were making a right turn into the Hollywood Studios backstage to get us running through the facades that lined the streets of their faux Hollywood of yesteryear. We weaved through, viewing the sights until we exhausted the roads and returned to the backstage and through what someone referred to as the “Disco Tunnel.” We returned to the park to see the dazzling sight of the Osbourne Holiday Lights and traverse our way through the illuminated holiday celebration. After the brilliant exhibition, we were back out of the park and on our way north to our final destination. 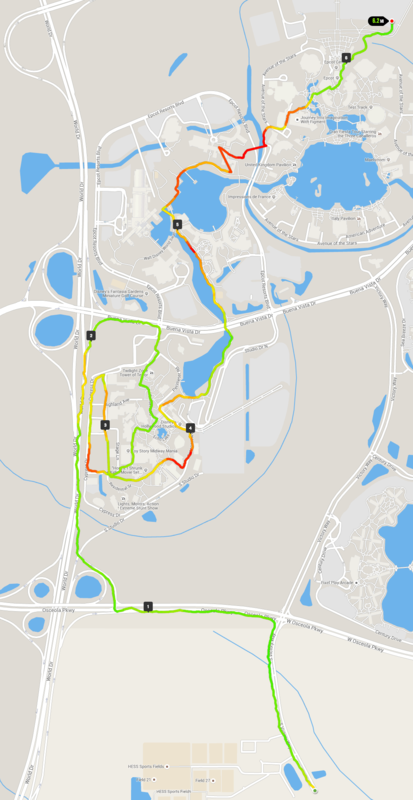 We ran moved to the narrow path beside the waterway that runs near the Boardwalk and Swan and Dolphin hotels when I felt the heat and humidity start to get to me. While I had started sweating almost immediately after starting running, the weather was finally getting to me, and I started overheating. I was forced to moved to intervals of walking for the final mile and a half or so of the race. We followed the pathway north and eventually crossed over to the World Showcase at Epcot. 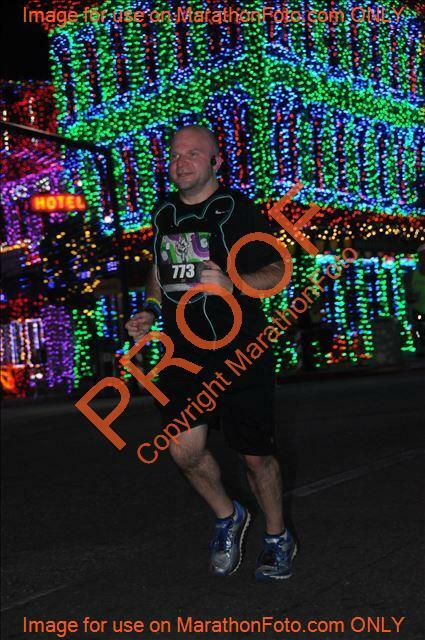 The race path took us directly to Future World, where the lights of the amusement rides and sights greeted us. The closer we got to the finish, the thicker the crowd grew to cheer us on and crossing the finish line right outside the Epcot park. With the shortened race, the distance we ran was 6.72 miles (according to the official results), a far cry from the 13.1 miles we were prepared to run. It’s unfortunate that the weather had such an impact, but even so I was able to complete the shortened course in 1:04:15. The race was over and it was time to lament the poor race and celebrate the completion by heading to the Wine and Dine Festival to eat and drink around the world.